Goodreads Summary: This is a world divided by blood – red or silver. First Thought After Finishing: This book has everything a good story needs. 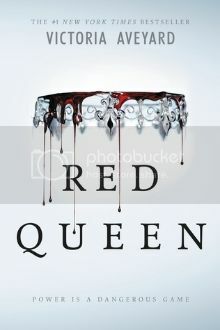 Some books do not live up to all of the hype about them, but Red Queen certainly does. This book has all of the elements of a fantastic story—an interesting world, political hierarchy and intrigue, underground rebellion, and, of course, romance. If there is an aspect of books that you love, it’s probably found in Red Queen. "What would I give to see my mother looking at me like that, back when I was nothing but a thief? What would I give now? The world is Silver, but it is also gray. There is no black-and-white." Mare Barrow is a Red, living under the rule of Silvers. All of her brothers have been drafted to the same war that injured her father. She lives as a thief, until the night she tries to rob the wrong person. Soon she finds herself in another life, caught up in a Silver world that she never imagined existed. In the Silver world, the people have a variety of abilities, from healing to super-strength to controlling fire. Nobles from the High Houses jockey for favor in the royal court. A Scarlet Guard threatens to overthrow the government. And in the midst of all of this chaos, Mare must come to terms with who and what she is. As intriguing as the world is, what made this book was the characters. Mare isn’t perfect, but she us strong and dedicated to what she believes in. Cal and Maven are brothers but like opposite sides of the same coin. Both have their own troubles but their own allure, working their way into my heart. Like Mare, I found myself torn between them, wanting to believe the best of both of them but never quite certain. But make no mistake, this isn’t anything like a normal love triangle. There are secrets and scandals, shifting emotions and tenuous connections. 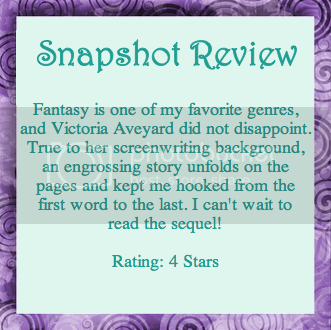 I loved these portions of the story as well as the more adventurous portions. This book was an emotional journey as well as an exciting one. It was hard to know what characters to trust, what everyone was hiding, and who I was hoping would prove to be the best in the end. I know there is much more to the story to come, and I’m looking forward to seeing how the characters keep developing. Most Memorable Aspect: This book was constantly full of surprises, which isn’t always common. I loved the twists and suspense that kept me guessing.